As much as I love to cook my healthy meals at home, sometimes life is crazy and we’re forced to grab takeout, or sometimes we just want a night off to grab a bite together! And that’s ok! Honestly, I sometimes struggle when I don’t have control over every ingredient I’m eating because I look and feel my best when I’m eating “my food” at home. But balance and moderation are key, and it’s it’s absolutely okay to eat out sometimes! However, if you eat out multiple times a week, then you probably won’t want to splurge every single time (although there is absolutely a time and a place for that too). 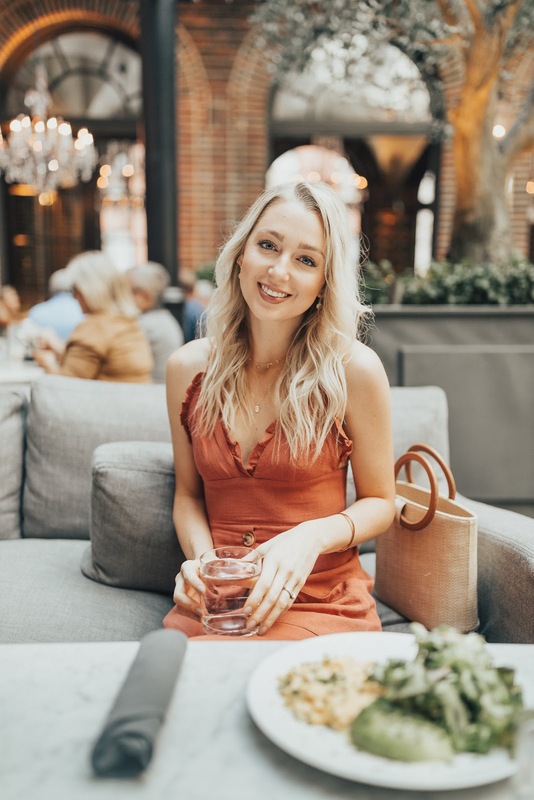 Beyond special occasions, I try to make the healthiest choices I can when eating out and am excited to share 10 of my tips with you! Is it your birthday dinner, anniversary or other special occasion? Girl, get the pasta you’ve been craving and drink a glass of wine with it! Is it a random weeknight when you don’t feel like cooking? That may not be the best time to carb-load. 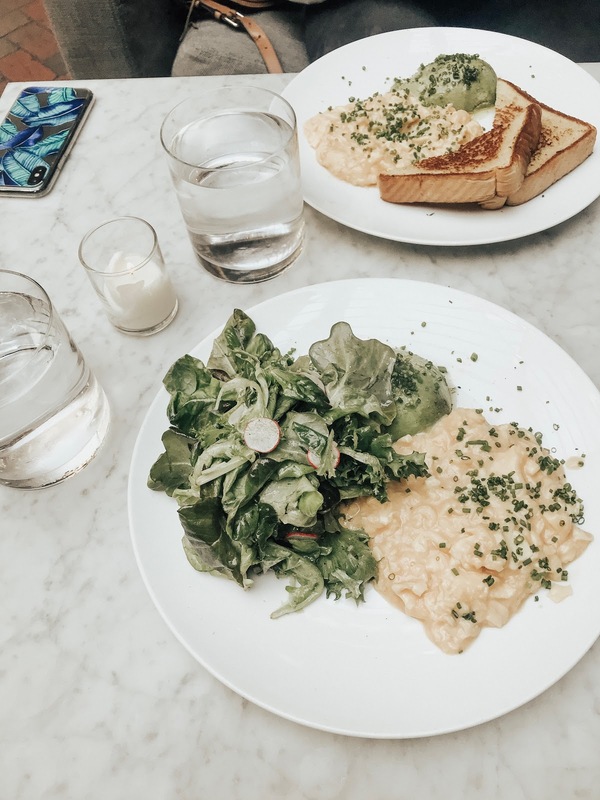 If you eat out multiple nights per week, then splurging every time is really going to add up over time, so figure out what balance works for you and pick and choose when you want to splurge. I often like to go in with a game plan or make sure a restaurant is a good fit for me ahead of time. For example, if there are zero gluten free options, then I won’t pick that restaurant. I also find that when I look at a menu ahead of time and come up with a few healthier options, then it’s easier to stick to one of those when it comes time to order. In general, I stick to drinks that don’t have calories because I’d much rather eat my calories. I love water, so I have no issues with drinking it at dinner or any other meal - and it’s free! I’d rather spend my money on food or activities most of the time anyways! If I’m on a nice date night with Trey I’ll get a glass of wine or a tequila cocktail sometimes, but I never drink soda or other “fancy” drinks on the menu that are typically full of sugar. Again, everything in moderation, but I personally choose to make modifications to most of my meals to make them gluten free and/or lower in carbs. I always order a burger or sandwich without a bun/bread, eat fajitas or tacos without the tortilla, keep the croutons off of a salad, and sub in a salad or vegetable for the fries. I find that all of these little swaps really add up and keep me on track with feeling and looking my best. Unless it’s your birthday or anniversary, I recommend picking between drinks or dessert instead of doing both. This will help prevent a huge blood sugar spike (which make us gain weight)! If I’m with Trey we usually opt for drinks, and if I’m with a friend (i.e. Jo), then we will usually splurge on gelato. Regardless of where I'm eating breakfast or brunch, I always get an egg dish. I skip on dishes like french toast or pancakes, especially now that I'm gluten free, but also because those are like eating a massive dessert for breakfast (totally fine here and there btw). If I'm at a nicer brunch spot I'll get an egg dish, then add some avocado or greens on the side (and maybe some bacon or smoked salmon). This ensures that I'm getting some fiber and greens alongside my protein and healthy fat. If I'm at a casual, diner-type spot, I'll usually opt for an omelette and I look for one with lots of veggies in addition to my protein. I now skip the toast on the side, unless I'm on vacation and there's a really good gluten free option available. If I can't get greens or avocado on the side, I try to eat half (or less) of my hash browns or breakfast potatoes. I’m sure it’s not as common everywhere, but people in the midwest sure love their fries and carbs! I'm constantly subbing in different side dishes! I love to do side salads and steamed or roasted vegetables for my sides. These mimic a more normal meal for me, help me to eat more vegetables and fiber, keep the calories down, and help me to feel good. Fried anything is no longer an option for me since I’m gluten intolerant and fried foods have always given me an instant stomach ache anyways, but skipping fried meats and foods is a good way to go at least 80-90% of the time. Not only are fried foods packed with carbs, calories and unhealthy fats, but the grease will really weigh you down, and in my case, cause a major stomach ache. I personally feel so much better when I stick to grilled or smoked options for my protein! Restaurant salads are often calorie traps and in fact, I don’t order a dinner salad that often. Often times restaurant dressings are packed with sugar and calories, and sometimes the toppings aren’t doing you any favors either (fried chicken, croutons, tons of fruit, cheese, etc.). Definitely weigh your options, but I often find I can put together a healthier meal (i.e. grilled chicken or bunless burger + a side salad or side of veggies) from other parts of the menu. I’ve recently started eating a bit slower, and also chewing my food more. Many of us tend to shovel our food down (especially if it’s super tasty), and I’m definitely guilty of that. Eating slower gives you time to not only savor what you’re eating and enjoy someone's company, but also allows your body to keep up and properly signal when you’re full. Many of us also don’t chew our food thoroughly, but spending a little more time chewing works wonders for the digestion! I hope you enjoyed these tips and found a couple of takeaways you can apply in your own life! Leave me a comment below about what you're planning to try or if you have some tips of your own!